Once your sales channels have been connected, and your catalog and inventory have been set up, you are ready to start picking and shipping your orders with SKULabs. Our all-in-one fulfillment solution features a number of ways to fulfill orders. Each workflow option has pros and cons depending on your ecommerce business's needs, so it's important to compare each route's advantages for your warehouse team. Before you pack and ship your order, you'll need to pick the items for the order from your inventory. There are a couple of ways that your team can do this. The main priorities to consider when choosing a picking method would be the speed of the picking process versus the accuracy of items picked. To pick an order with barcode scanning, start by selecting the order from the processing orders list. Select "start picking", then begin scanning item barcodes to clear the items from the picking list. If an item is available in multiple locations, select the location you're picking from before scanning the item. This will ensure that the inventory is deducted correctly after the order has been shipped. If an item barcode is not available, select "Verify" next to the item on the picking list. This will mark the item as cleared without requiring a scan. Once all of the order items have been cleared, the order will be marked as cleared and you will be given the options to ship the order or to move on to the next order in the processing list. In some warehouse fulfillment scenarios, scanning items to verify order picking accuracy is not possible or desirable. For those cases, we offer a number of paper-based picking options. To print picking documents for a single order, select the order from the processing orders list. From there, you can print a packing slip or invoice to use as a reference when picking the order items. To print picking documents for multiple orders, select the orders by toggling the checkbox next to each order in the orders table. Then open the Actions menu and choose between packing slips or pick lists for the orders. Packing slips feature order details such as the customer's address and shipping method in addition to each item's name, SKU, quantity ordered, and quantity shipped. These are commonly included in the packed order for the recipient to reference. Pick lists combine all of the items and quantities needed to fulfill all of the selected orders into a single list. 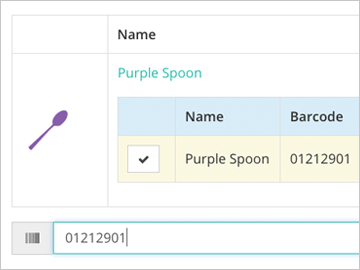 This allows your team to pick items in bulk for several orders at once, then separate the items into their respective order packages later. 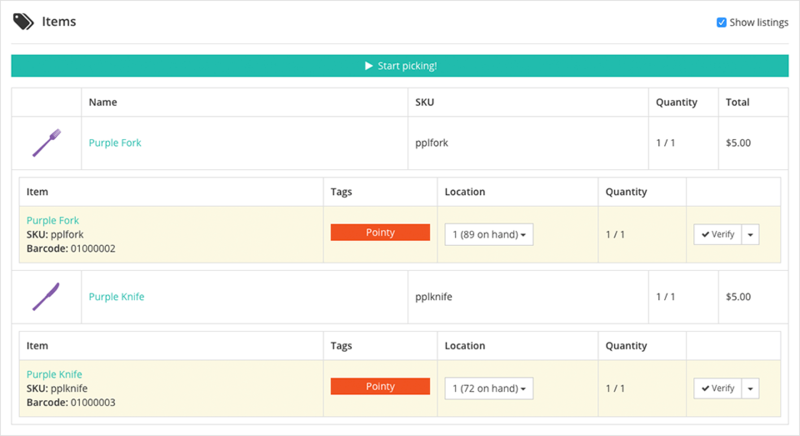 Grouped pick lists combine elements from packing slips and from pick lists. 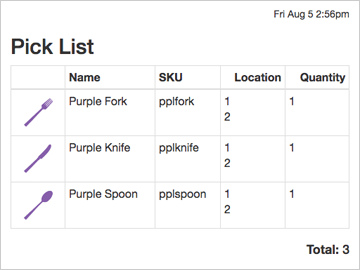 Grouped pick lists are separated per order, but are simplified to only show the item names, SKUs, picking locations, and required quantities per order. 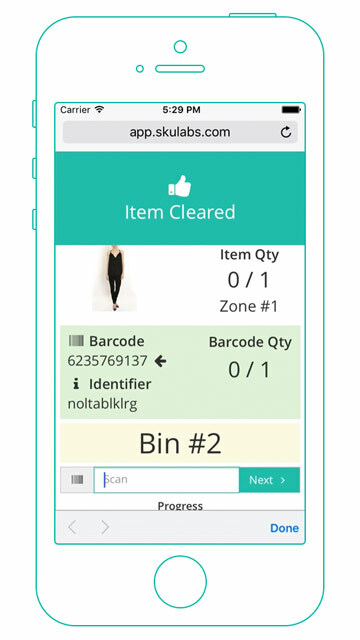 While item verification is recommended during picking to ensure order accuracy, SKULabs does not require you to pick and scan items before shipping an order. You are free to skip the picking process and continue directly to configuring a shipment and printing a label for the order. When an order is shipped, it will be marked as shipped on its source sales channel, with tracking information included if the channel supports this, and the order items shipped will be deducted from inventory. Additional settings exist that allow packing slips to be automatically printed and for email confirmations to be sent to customers. To create a shipping label for a single order, select the order from the processing orders list. In the Shipments panel, select Add to open the Add Shipment window. The Add Shipment Window will show the shipping address, address type (residential, commercial, or international), the requested shipping method, the amount paid for shipping by the customer, and the shipment details that can be modified. At a minimum, all shipments require dimensions, weight, and a shipping method to be filled in. Optional shipment features include signature confirmation, carrier insurance, Saturday delivery, and more. If an item is shipped by itself, the dimensions and weight of the item (if available) will be set as the shipment's dimensions and weight. If multiple items are being shipped together, their weight values (if available) will be added together and the total will be set as the shipment's weight. If the order item or combination of items have been shipped previously, and the "memorize" option was enabled in that shipment, then the memorized dimensions and weight will be set for this shipment. Default shipment values set in the store's settings can be applied if none of the above are applicable. If some shipment values can not be automatically retrieved, or if the existing values are incorrect, be sure to correct those before submitting the shipment. To avoid having to manually enter the package dimensions, you can select one of your saved box sizes from the menu next to the dimension fields. You can also retrieve the package weight from a connected USB scale by selecting the button next to the weight fields. To create shipping labels for multiple orders, select the orders by toggling the checkbox next to each order in the orders table. Then open the Actions menu and select "Ship orders". The dialog window that appears will display each order selected and their pre-configured shipment settings. If some shipment values can not be automatically retrieved, or if the existing values are incorrect, select the Edit button ( ) next to that shipment to correct its settings. Once each shipment is correctly configured, you can select Ship to mark all of the orders as shipped, send the tracking information back to their respective sales channels, and print out all of those shipping labels at once. An alternative to the standard picking and shipping workflow is our exclusive batch mode. This is a more advanced method of checking orders, enabling the user to pick, pack, and ship several orders at once. This can drastically increase fulfillment speeds per order by eliminating redundant action and streamlining your path through your warehouse. A batch is a set of similar orders that can be fulfilled together. They often share some of the same items, or their items are primarily in the same picking locations. Each order in the batch is assigned to a bin on a picking cart, which you can take through your warehouse in one fluid path. Batch picking uses the inventory locations you created to move through the warehouse as smoothly and efficiently as possible. Once all of the batch items have been picked, SKULabs lets you print out shipping labels on the spot as soon as you're done picking everything. To get the most out of the efficiency gained with batch fulfillment, there are some recommended steps to take. First, you should consider investing in mobile picking devices paired with Bluetooth barcode scanners. These will allow your picking team to scan and verify items on the go, without having to return to a picking station in the middle of the batch process. See our hardware recommendations. You should also configure your user's batch settings. These settings will determine what kind of orders are added to new batches you create, as well as how many orders will be added, whether or not packing slips will be printed out at the beginning, and other parameters that can be set or modified. To begin picking orders, connect your barcode scanner to your picking device (whether it's your desktop, tablet, or smartphone) and open a batch from the batches list to start picking (or simply selecting Start Batch). Unlike the default order picking interface, the batch order checker will guide you through the picking process to ensure that you pick as efficiently as possible. The page will highlight one barcode at a time, indicating that that is the barcode currently in progress. To clear it, scan the barcode once per item until you have scanned enough of that item to clear it, then move on to the next highlighted item. The guide will bounce you between orders, so be sure to watch which bin you place items in. You'll need to scan the bins themselves between item scans to verify that you placed the item in the correct bin. You can set up bins in the Batches page, or print bin labels on the Printing page.